“Though this sequel is comparatively short, Electronic Super Joy: Groove City is just as fun, challenging, and well-executed as the original full-length game.” Read our full review for more! 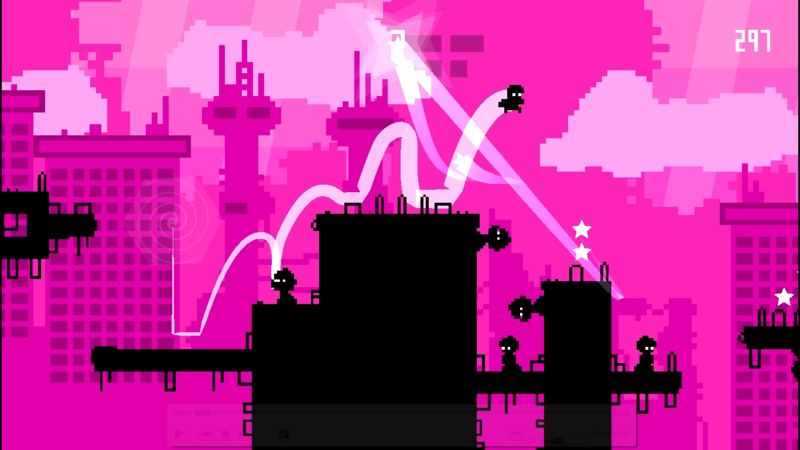 Electronic Super Joy: Groove City is a standalone mini-sequel to the 2013 platformer Electronic Super Joy. The game is driven by excellent dance music by EnV and a dark and twisted sense of humor. It’s also an extremely difficult platforming game, featuring precision gameplay and downright unfair enemies. That’s the joy and frustration of the series. The sequel picks up years after the original game. The Space Pope is still gone and Groove City is now a thriving metropolis. Everything is fine until a giant robot stripper rampages through the city and destroys everything. Now you must bring back the evil Space Pope in order to have any chance of saving Groove City once more. 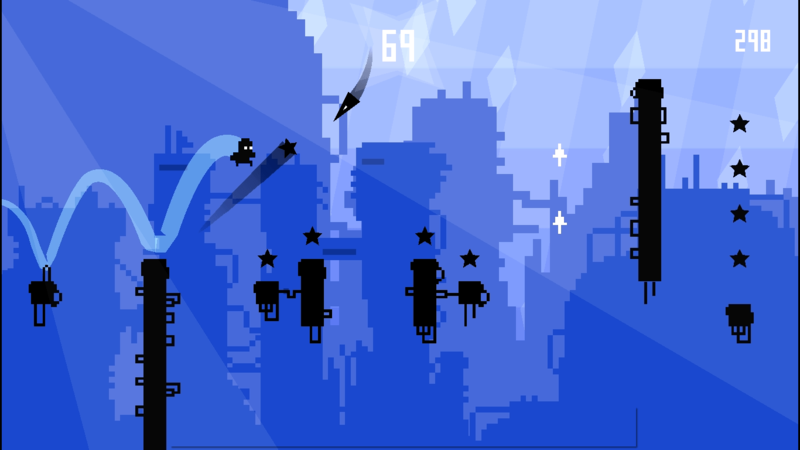 It’s fair to call Electronic Super Joy: Groove City a twitchy platformer. Your success does not depend on luck, but rapid precision on levels that start hard and only grow harder. You will want to throw your controller in disgust at some of the sinister new tricks in the game. For example, you can now collect white stars all over each level. Good luck finding a way to get to all of them without dying repeatedly. Adding a collection element is perhaps the cruelest of the new features in the sequel. Plus, the stars lead you to the location of secret area that you don’t even stay in when you die. You are cruelly booted back to the source level, forced to navigate the hardest platforming in the game to even have a chance of completing the bonus levels. You will grow to hate these black stars. Nothing good comes from them. Then there are the brand new black stars. The black stars summon the heat-seeking missiles that made the original game so challenging in the boss fights. On top of the live enemies on the ground, platforms that you can miss just by breathing the wrong way, and the distraction of the flashing neon graphics, you now need to decide how many black stars is too many to deal with on a given level. Oh, you can try to avoid launching a missile at yourself while playing. You can’t, but you’ll try anyway. You will reach a point on any stage with the black stars where you must decide if three missiles on a faster path are better than two missiles that leave you scrambling out of a pit before impact. Groove City is billed as a mini-sequel and that’s an accurate description. The game only features 15 levels compared to the original’s 45. That said, I spent many more hours than I care to admit trying to reach the halfway point of this game, let alone complete the whole thing for this review. It’s a rewarding challenge that any seasoned platformer fan should be happy to take on. Though this sequel is comparatively short, Electronic Super Joy: Groove City is just as fun, challenging, and well-executed as the original full-length game. Robert is a writer and music director from NJ. He plays a lot of games and consumes a lot of strange horror, sci-fi, and fantasy media.